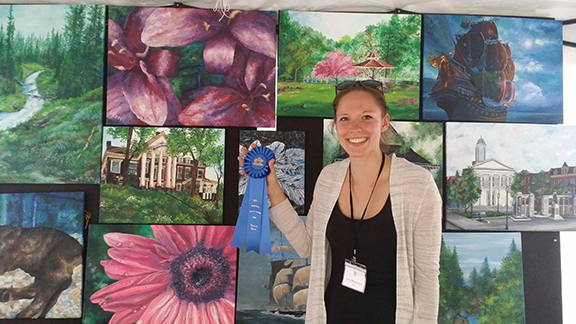 Congratulations to geography graduate student Tara Mazurczyk for winning Best in Show at the Bellefonte Arts Festival held August 12–13. Weekly publication of DoG enews resumes. Coffee Hour speakers will be included soon. Continue to send your good news, story ideas, and photos from fieldwork and travels to geography@psu.edu. Kimberley Thomas published an article about water sharing in South Asia in The Third Pole. A new course encourages students to take a highly interdisciplinary approach to dealing with pressing environmental challenges. The curriculum is an introduction to critical zone science, an emerging field that brings together scientists with diverse backgrounds to study the place where rock, soil, water, air and life meet. In Big Data for Regional Science (2017). natural, manmade and technological hazards. The emergence of megacities led to the quick development of facilities needed to supply millions of people with necessary resources, including food, energy, and water. This paper analyzes why and how wasteland development narratives persist through an evaluation of wasteland development policies in India from 1970 to present. Integrating critical scholarship on environmental narratives and enclosures, I find that narratives of wastelands as “empty” spaces available for “improvement” continue because they are metaphors for entrenched struggles between the government’s shifting visions of “improvement” and communities whose land use practices contradict these logics. Since the 1970s, “improvement” has meant establishing different types of tree plantations on wastelands to ostensibly provide energy security. These projects have dispossessed land users by enclosing common property lands and by providing forms of energy incommensurate with local needs, a trend I term “energy dispossessions”. Factors enabling energy dispossessions include the government’s increased attempts to establish public–private partnerships to carry out “improvement” and a “field of observation” constructed to obscure local livelihoods. Unveiling these logics will help to problematize and contest future iterations of wasteland development. Political ecology and industrial ecology have emerged as influential, but distinct, intellectual thought traditions devoted to understanding the transformation of nature-society relations and processes. Evolving from the pioneering work by physicists and environmental engineers in the late 1960s (e.g. Ayres and Kneese, 1969), industrial ecology emerged as a distinct field in the 1990s (Graedel and Allenby, 2003). It is a largely normative project that seeks to quantify and dematerialize the resource stocks and flows of industrial ecosystems, product life cycles, and societal metabolisms. To systematically dissect production-consumption processes across cradle-to-grave phases (e.g. extraction, manufacturing, use, reuse), industrial ecology deploys material flow analysis, life cycle assessment, environmental input-output modeling, amongst other methods, and has cultivated more abstract principles and practices such as industrial symbiosis and socio-economic metabolism. As the field has matured, industrial ecology has branched out by becoming more heterogeneous, not only in terms of topical foci and methodology, but also in terms of how it understands the material basis of societal transitions (cf. Vienna School of Social Ecology; Haberl et al., 2016). Nevertheless, the overwhelming focus of industrial ecology is on the material rather than social dimensions of resource use. 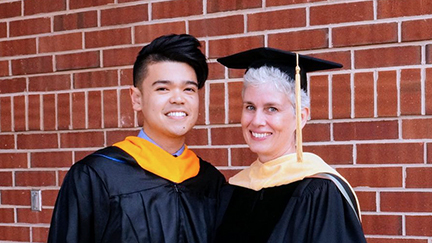 Bill Limpisathian (left) graduated with his master of science degree in geography on Sunday, August 12, Penn State’s summer Commencement. With him is his adviser and head of the department, Cynthia Brewer. Congratulations to all our geography grads! Weekly publication of DoG enews resumes on August 29, 2017. Continue to send your good news, story ideas, and photos from fieldwork and travels to geography@psu.edu. Welcome to visiting faculty member Nai Yang. He will be here for one year, working on GIScience research topics in collaboration with faculty and students in GeoVISTA. His past research includes a range of topics in 2D and 3D terrain representation and generalization, geovisualization, spatial analysis, and GIS applications. The 2017 Institutes for Energy and the Environment (IEE) seed grants have been awarded to a pool of interdisciplinary researchers at Penn State. Thirteen grants totaling more than $312,000 have been awarded to 42 researchers that addressed four of IEE’s five research themes: Climate and Ecosystem Change, Future Energy Supply, Smart Energy Systems, and Water and Biogeochemical Cycles. In recent years, various levels of government in the United States have adopted or discussed subsidies, tax breaks, zoning laws, and other public policies that promote geographic access to healthy food. However, there is little evidence from large-scale longitudinal or quasi-experimental research to suggest that the local mix of food outlets actually affects body mass index (BMI). We used a longitudinal design to examine whether the proximity of food outlets, by type, was associated with BMI changes between 2009 and 2014 among 1.7 million veterans in 382 metropolitan areas. We found no evidence that either absolute or relative geographic accessibility of supermarkets, fast-food restaurants, or mass merchandisers was associated with changes in an individual’s BMI over time. While policies that alter only geographic access to food outlets may promote equitable access to healthy food and improve nutrition, our findings suggest they will do little to combat obesity in adults. International cooperation has become a universal mandate for governing transboundary waterbodies. Diverse stakeholders promote cooperation as a desirable, if not indispensable, approach to achieving sustainable and equitable benefits from and for transboundary waterbodies. However, calls for international water cooperation operate from the presupposition that cooperation is an unambiguous concept. While cooperation appears self-evident and unproblematic, cases of formal cooperation reveal points of contestation about cooperation itself. For example, India and Bangladesh disagree about the extent to which cooperation is occurring over the Ganges River despite having penned a bilateral treaty that has been in force for 20 years. I analyze qualitative interviews and previously unpublished hydrological data to evaluate assertions that hydrological hazards in Southwestern Bangladesh result from India’s activities and that India is failing to uphold the 1996 agreement. The analysis indicates that these assertions are true and false: India is broadly adhering to the Ganges Treaty but unilaterally withdraws water during a critical period of the dry season when regional livelihoods are most vulnerable. The study concludes that transboundary water cooperation as an abstract ideal overlooks the fact that cooperation as a practice emerges from and operates within specific historical, political, cultural, and economic contexts. Social media streams and remote sensing data have emerged as new sources for tracking disaster events, and assessing their damages. Previous studies focus on a case-by-case approach, where a specific event was first chosen and filtering criteria (e.g., keywords, spatiotemporal information) are manually designed and used to retrieve relevant data for disaster analysis. This paper presents a framework that synthesizes multi-sourced data (e.g., social media, remote sensing, Wikipedia, and Web), spatial data mining and text mining technologies to build an architecturally resilient and elastic solution to support disaster analysis of historical and future events. Within the proposed framework, Wikipedia is used as a primary source of different historical disaster events, which are extracted to build an event database. Such a database characterizes the salient spatiotemporal patterns and characteristics of each type of disaster. Additionally, it can provide basic semantics, such as event name (e.g., Hurricane Sandy) and type (e.g., flooding) and spatiotemporal scopes, which are then tuned by the proposed procedures to extract additional information (e.g., hashtags for searching tweets), to query and retrieve relevant social media and remote sensing data for a specific disaster. Besides historical event analysis and pattern mining, the cloud-based framework can also support real-time event tracking and monitoring by providing on-demand and elastic computing power and storage capabilities. A prototype is implemented and tested with data relative to the 2011 Hurricane Sandy and the 2013 Colorado flooding. Members of the Geoinformatics and Earth Observation (GEO) Laboratory at the National Center for Atmospheric Research where they are conducting research this summer. Travis Young successfully completed his comprehensive exams and defended his proposal on July 24, 2017. William Easterling will be named an American Meteorological Society Fellow at the January 2018 Meeting. Rob Brooks was quoted in a Christian Science Monitor article about the Clean Water Rule, also known as the “Waters of the US” rule, or WOTUS. Weiming Hu was featured in an EMS Summer Dispatch. Some of the URLs at Pennsylvania Spatial Data Access (PASDA) are going to change on August 7, 2017. This only affects FTP and Map Services; the website is unchanged and is still at www.pasda.psu.edu. PASDA is Pennsylvania’s official public access geospatial information clearinghouse. PASDA was developed in 1996 by Penn State and has served as the clearinghouse for Pennsylvania for over twenty years. Links to these new URLs are up-to-date on the website. If you have bookmarks, code, or MXDs that consume PASDA map services, you may need to update your local content to reflect the changes. Questions may be directed to Ryan Baxter. During the civil rights movement, activist groups such as the Student Nonviolent Coordinating Committee (SNCC) used geography and geospatial intelligence to identify protest sites and to plan civil rights protests. A new $373,000 National Science Foundation grant is letting researchers dig into those geospatial tactics to see what can be learned about patterns of racial inequality and how the SNCC collected and leveraged geospatial intelligence data to bolster its activist efforts. Robert J. Farnsworth, a retired U.S. Army reconnaissance engineer and Penn State alumnus, was selected to receive the 2017 Lt. Michael P. Murphy Award in Geospatial Intelligence. He was honored during the 2017 United States Geospatial Intelligence Foundation (USGIF) Symposium in San Antonio on June 5. Farnsworth was presented with the award by Keith J. Masback, CEO of USGIF; Nancy S. Coleman, vice president of corporate communications at DigitalGlobe; and Todd S. Bacastow, geospatial intelligence faculty member with the College of Earth and Mineral Sciences’ John A. Dutton e-Education Institute. 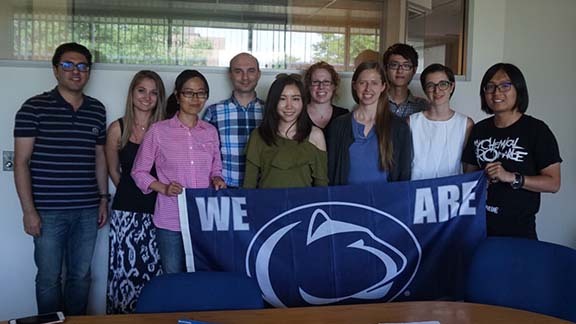 A team led by researchers in Penn State’s College of Agricultural Sciences has received a nearly $500,000 grant from the U.S. Department of Agriculture to conduct a three-year study of a new flexible strategy to ramp up installation of riparian buffers. Two areas still need further examination in the ecological study of inequality and mortality. First, the evidence for the relationship between income inequality and mortality remains inconclusive, particularly when the analytic unit is small (e.g., county in the U.S.). Second, most previous studies are cross-sectional and are unable to address the recent diverging patterns whereby mortality has decreased and income inequality increased. This study aims to contribute to both topic areas by studying the relationship between inequality and mortality via a spatiotemporal approach that simultaneously considers the spatial structure and the temporal trends of inequality and mortality using county panel data between 1990 and 2010 for the conterminous U.S. Using both spatial panel random effect and spatial panel fixed effect models, we found that (a) income inequality was not a significant factor for mortality after taking into account the spatiotemporal structure and the most salient factors for mortality (e.g., socioeconomic status); (b) the spatial panel fixed effect model indicated that income inequality was negatively associated with mortality over the time, a relationship mirroring the diverging patterns; and (c) the significant spatial and temporal fixed effects suggested that both dimensions are critical factors in understanding the inequality-mortality relationship in the U.S. Our findings lend support to the argument that income inequality does not affect mortality and suggest that the cross-sectional findings may be a consequence of ignoring the temporal trends. Nearly 50 years of declining heart disease mortality is a major public health success, but one marked by uneven progress by place and race. At the county level, progress in heart disease mortality reduction among Blacks is associated with place-based historical legacy of slavery. Effective and equitable public health prevention efforts should consider the historical context of place and the social and economic institutions that may play a role in facilitating or impeding diffusion of prevention efforts thereby producing heart healthy places and populations.